Inspiration for a home often comes from a specific location. In this case it was a pine grove situated on a hillside. The beauty of the property was also one of the primary challenges. 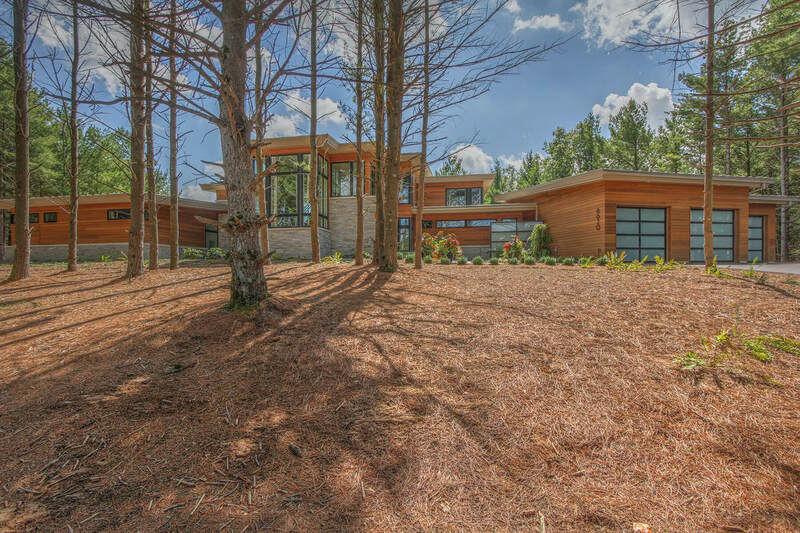 After a site walk-through with AMDG, the couple began to see the need to have their home designed and oriented to showcase the natural slope of property, the path of the sun, and the pine trees they had come to love. 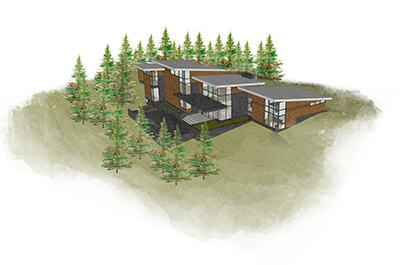 Three-dimensional modeling gave the design team and homeowners a realistic sense of how the home could be integrated into the property’s existing slope. Rather than excavating the crest of the hill and extending the back of the home outward at tree-limb level, AMDG proposed a more challenging solution: gradually stepping the foundation downward, section by section. Today, the homeowners benefit from ground-level views and a walkout seating area. To determine the home’s orientation and manage the amount of light entering the home, AMDG conducted a study of the sun’s daily paths throughout the year. This led to a roof overhang that minimizes summer glare, while allowing the sun’s warming rays in the winter. Complex cantilevered framing makes it possible for windows to occupy corners. 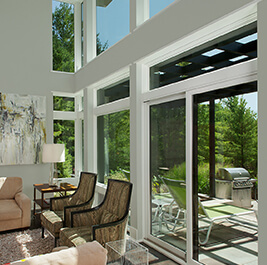 Along with direct and indirect sunlight, the homeowners enjoy three-way views to the outdoors. The homeowners approached AMDG with a design for their home in mind. “We wanted modern clean lines, but also organic elements like stone and wood to bring the outdoors in.” This concept was enhanced by stone that begins inside and continues through the home’s exterior. 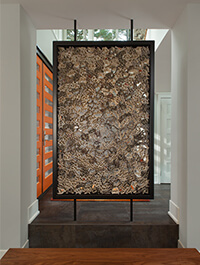 The homeowners commissioned a custom extruded ceramic installation to serve as both art and as an architectural wall screen. A space utilization survey of the homeowners’ previous residence made it possible to design their new home around their daily activities. There’s no reason a primary residence can’t also serve as a retreat—a place to be at peace after a long day. At this particular resort, the pine trees are the perfect backdrop for the art on display. There are places to relax, take in views, and listen to breezes coursing through pine needles. It all adds up to the perfect getaway. Best of all, the homeowners never have to turn in the key.